Time to move! Taking time for activity throughout the day can improve your child's attention, focus, and performance. In this worksheet, Roly demonstrates the Mountain Pose. Kids can colour in the picture, and practise this yoga pose along with him. In this worksheet, CuzCuz demonstrates the Cat Pose. Kids can colour in the picture, and practise this yoga pose along with him. In this worksheet, Floyd demonstrates the Cow Pose. Kids can colour in the picture, and practise this yoga pose along with him. In this worksheet, Tutu demonstrates the Dog Pose. Kids can colour in the picture, and practise this yoga pose along with her. In this worksheet, Birdee demonstrates the Puppy Pose. Kids can colour in the picture, and practise this yoga pose along with her. In this worksheet, Officer Ice Cream demonstrates the Cobra Pose. Kids can colour in the picture, and practise this yoga pose along with him. In this worksheet, Penelope demonstrates the Warrior Two Pose. Kids can colour in the picture, and practise this yoga pose along with her. In this worksheet, Muggo demonstrates the Happy Baby Pose. Kids can colour in the picture, and practise this yoga pose along with him. Promote the well-being of your first or second grader's mind and body by teaching him some beginning yoga poses and techniques. 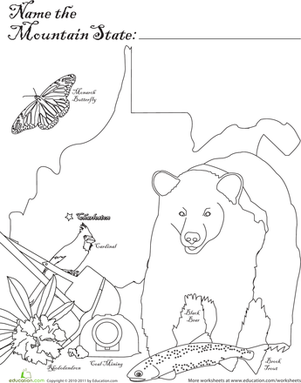 Test your child's state knowledge with this mystery coloring sheet, featuring the Mountain State. The man on top of the mountain didn't fall there! Your child will enjoy coloring this picture of a mountain climber working hard to get where he wants to go! While giving life to this mountain scene, your kid will be honing his fine motor skills.